So you've seen all the pics and now you are jonesing to visit the magical lands of the blue-green water. Well get in line! No really, you will have to get in line because everybody and my mom wants to go to Havasupai. (Any good photos in this post were almost definitely taken by Nate Polta). For good reason. This place is unlike any other I've ever been or heard of, and its all right down at the bottom of a canyon in good ole Arizona. It is truly surreal. I don't want to be too hipster but you know, I did go before it was cool. JK it's always been cool. But I did visit 4 years ago now when it wasn't as well known sooooo yes. That is simply a fact that makes me no more or less worthy of brownies than any other person. Moving on. I want this post to give all the necessary planning and execution deets (including best waterfall jumps). Please refer to my Havasupai packing list for packing information. First, let's get some schooling. Havasupai (as made famous by social media) is actually a part of the Havasupai Indian Reservation. To get to the waterfalls and camping you will walk through Supai Village where there is a large Native American community who owns and manages the land. Supai Village is located 8 miles below the rim of the Grand Canyon. "Havasu Baaja" (the Tribe's original name) actually means people of the blue-green water, so this Tribe is named after the most distinctive characteristic of their home. Today the Tribe is known as the Havasupai Tribe. It's important to be respectful of the fact that you are visiting this Tribe's home when you are camping and make sure to follow the guidelines they have in place to protect their land. You can find more information about the Tribe and the regulations of visiting Havasupai on their website. Let's get down to the nitty gritty. How do you visit this paradise? You need a permit. The Tribe allows a limited number of people to enter and camp each day during summer. These days, this is a feeding frenzy. Reservations opened on February 1st, 2018 for summer 2018 reservations and they were gone in a day apparently. Now if you miss this opportunity, it's possible to get a cancelled reservation by continually checking back. Campground reservations for all of 2018 (February 1 to November 30) started on February 1, 2018 at 8:00 AM Arizona Time. The campground is a "camp wherever you want" campground running for over a mile on both sides of Havasu Creek between Havasu Falls and Mooney Falls in the Grand Canyon. There is a maximum of 4 Days / 3 Nights per reservation. You are welcome to make multiple back-to-back reservations to extend your stay if those dates are still available (however, there are no refunds on any resulting pricing differences). When making a reservation, you will have the option to add the name of a person you authorize to be able to use your reservation to check-in at the Tourist Office as if they were you. 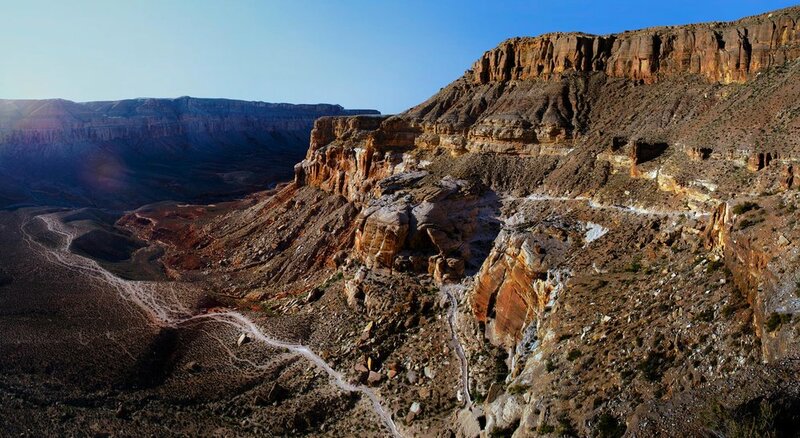 The reservation is only valid if at least one of the two people named on the reservation is present at the Tourist Check-in Office in the Village of Supai (on the way to the campground) with photo ID - otherwise the reservation is NOT valid and will NOT be honored. All reservations are paid in full at the time the reservation is made and are NON-REFUNDABLE and NON-TRANSFERABLE (i.e. the individual listed on the reservation cannot transfer the reservation to another individual). Reselling of reserved permits is strictly prohibited. Any person caught reselling or buying a reserved permit may, at the discretion of the Havasupai Tribal Tourism Department, be permanently banned from Havasupai. Tribal discounts are processed upon check-in with a valid reservation and identification. No day hiking permitted - all visits require at least a one night reservation made prior to arrival. Havasupai is an excellent place to propose to all your friends. When you click the "make a reservation" button, a calendar shows up with available camping nights. As of right now, there is no availability this Summer. But, I would recommend calling them fairly consistently if you want to go this summer because you can get a cancelled reservation. 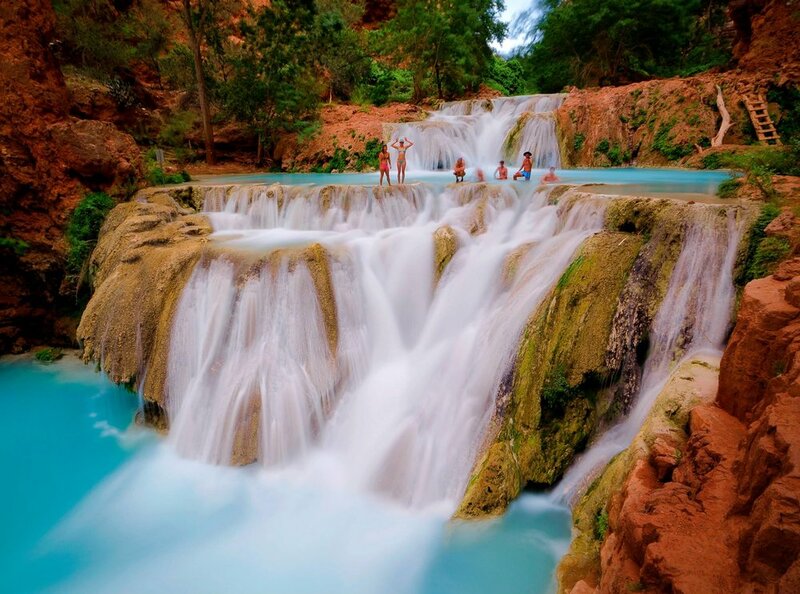 If you really want to go to Havasupai, be ready when the reservations open next year and instantly book. Honestly I would recommend actually calling them on the day reservations open and going online to double your chances. Beggars can't be choosers but this trip is definitely the most fun when it's hot out, but not unbearably hot. That means late spring/early summer or late summer/early fall. I went in May and it was just hot enough. So the best time to go would be May/June or September/October. I have a feeling it's just so so hot in August the sleeping would be rough, not to mention the hike out- but the waterfalls would feel amazing. The Tribe closes the land December and January. This is a backpacking trip so plan accordingly. The hike down from the parking lot is about 8 miles. The way down is, well down. It's moderate slope downhill the whole time in a canyon wash. Lots of sand and lots of opportunities for blisters. If you wear hiking boots, make sure they don't give you heat blisters and wear a thin synthetic sock. If you wear running shoes, make sure they aren't made of mesh where you are going to get sand in them constantly- I have gotten some pretty nasty blisters that way. Here is where you are going: Hualapai Hilltop. That's the trail head. The beginning of the hike down... or the end of the hike up. Now there are options other than hiking down with your full backpack. You can take a helicopter or ride a horse into the village. From there you can stay at a lodge in the village or trek another few miles to the bottom of the canyon where the campsite is. The hike really isn't bad so I recommend walking if you can. If you are nervous about being able to carry your pack you can pay for a horse to carry it in and/or out of the canyon, so you just hike with your day pack. Someone in my group got pretty gnarly bruises from his pack on the way down, so he paid to have a horse carry it out. HOWEVER, there has been a lot of discussion about the treatment/abuse of the horses used to transport gear in Havasupai. For more information you can visit havasupaihorses.org. If you are considering using a horse, I recommend you do some research and make sure you are making an informed decision. You can find and book the pack-horse options here. Between Campground (or Lodge) and Hilltop Trailhead: $235 one way, $470 round trip. Between Campground and Village: $175 one way, $230 round trip. One Pack Mule can carry a maximum of 4 bags for a total weight of 130 lbs. Maximum Baggage Size: 36 inches long and 19 inches wide. Ice Chest: Max 48 quart capacity, not to exceed 24' long and 19' wide. Maximum size and weight limits are strictly enforced. Between Campground (or Lodge) and Hilltop Trailhead: $250 one way. Between Campground and Village: $175 one way. 10 lbs, long pants, and at least some prior horseback riding experience. Once you get to the bottom of the canyon you get to pick your campsite! It's free for all camping in the designated area an there are lots of cools spots. Just keep walking downstream until you find the perfect place. We camped on an island in the river. There is a bunch of amazing hiking once you get down to the campsite. On your way before you get to Havasu Falls (the giant one) you will see Little Navajo Falls on your left. Super fun place to play around in the water and jump! If you hike downstream from the campground, you will find Mooney Falls and then Beaver Falls. Definitely do this - both areas are incredible. You will hike through Jurassic Park (see right) and have to climb through caves and up and down cliffs. Basically- be prepared to have the time of your life. The hiking is so fun! Being cool at Beaver Falls. For a detailed packing list and more info on what you need to live your best life in Havasupai, check out my Packing List for Havasupai.... duh.